Update 2013.04.26: we have published the jQuery version of this plugin, please see it if you prefer to use jQuery. 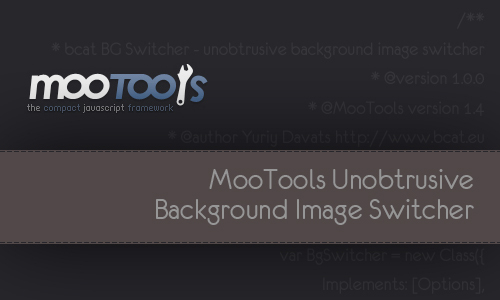 There are plenty of image slider and gallery scripts out there, but recently we had a pretty specific goal – to switch backgrounds of a website, and couldn’t find a good MooTools solution to accomplish it, so we had to create our own MooTools Class. Only the first one has to be loaded, the rest must “wait for their turn” and load as needed. After all the images are loaded they just switch. That’s the unobtrusive part so that we can use a lot of heavy background images without having to worry about load times. The image has to be preloaded and only shown after the load is completed. It has to support responsive full screen background feature without breaking the image’s proportions on any screen/window size. As with all the scripts it has to be lightweight and play well with other front end features. Images used in this demo are copyrighted and only intended for this demo. The class works with MooTools 1.3 and 1.4 including the latest version at the time. It uses Asset.image from MooTools More to preload images but we load generic MooTools More package in the demo. Browser support: IE8+ and other browsers that are not too old. This is a great piece of code ! Do you have any idea if it’s possible to make this work with Mootools 1.2.x ? I’m stuck with this version and it seems that it’s not working with it. Hi Renauld, thanks for your feedback. It should be possible to make it work in 1.2 but as you probably know, version compatibility is not the strongest point of MooTools so you’ll have to look into console and swap some functions per hand. So the initial image states and animation methods had to be changed, maybe it will be of some help. Post your test url if you’re stuck, I’ll look into it. Why don’t you add it to forge? Thanks so much! Very elegant and straightforward compared to most of the others out there. I appreciate your good work. Thankyou so much ! Wonderfull work ! Simple and perfect. How about scaling images to adapt to navigator window size in fullscreen mode ? Hi Milazzo, thanks for the feedback! Images are already being scaled (while retaining proportions and filling the viewport so some crop is inevitable). What you might have noticed in the demo is the size of #wrapper element getting in a way of making viewport smaller. You can just drop it in your project or make it relative / responsive/ whatevs, you only need #bg-body and #bg-body img rules. See the CSS-Only Technique #2 at css tricks ( http://css-tricks.com/perfect-full-page-background-image/ ) for the styles that we used here as well as their explanation. Yuriy, thanks for quick reply, but not working yet. An image smaller than navigator window strech perfectly, but bigger images are not shrinked (some images shrink a little bit), only cropped..
Hey Milazzo, if you excluded container / wrapper styles and still need the images to scale differently, you might have to style these two selectors specifically for your project (or just pick another technique from the same css tricks article).